Felipe Pantone is an artist. Felipe Pantone (born in 1986 in Argentina) is considered today as one of the great figures of street art. An innovative artist, he has gained an international reputation in the world of street art, paving the way for several collaborations around the world, including his recent exchanges with Futura. A prolific artist, his creations can be seen on the walls of the world: from the Mesa Contemporary Arts Center at the Long Beach Museum of Art (United States) to the Palais de Tokyo (Paris, France), Mexico, Japan, Portugal, Palestine, Italy or Australia. Only 30 years old, he has already participated in numerous large-scale museum exhibitions, including Art From the Streets in Singapore, and Beyond the streets in Los Angeles. 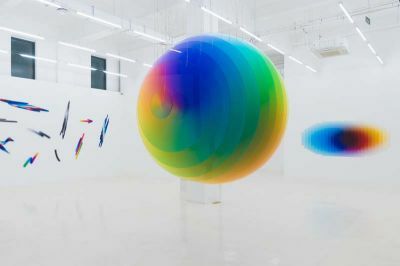 In his works, Felipe Pantone questions the society in which we live and his propensity to place new technologies at the center of our daily lives. Crossing the conventional barriers of street art, Pantone stands out as an artist in its own right. Influenced by research on the color of the Venezuelan artist Carlos Cruz Diez, he succeeds in fusing geometric forms, chromatic work and elements of contemporary modernity to create a singular universe where the use of bright and metallic colors, contrasting with the omnipresent duo black and white, reinforces the psychedelic effect of the compositions. Playing on visual overlays, flows and abrupt breaks in rhythm, approaching the work of a Ryoji Ikeda, he questions the speed at which new technologies evolve and make us dependent on an overabundance of images and alienating symbols.